The prominent debate in the young years of neuroscience was whether or not the brain had specialized functional regions or whether the brain as a whole was responsible for all cognitive functions. Franz Joseph Gall was the first to assert the radical notion that all behavior emanated from the brain and that specific regions of the cerebral cortex (the large, convoluted structure on top of many pictures of the brain) controlled specific functions. Though, these assertions would be shown to hold water, he falsely viewed the brain as being synonymous to a muscle, with specific areas getting larger with use, which would cause the skull above these areas to bulge, meaning that the surface of the skull could give information about one’s mental state. This became known as phrenology and though the idea of the skull’s shape being indicative of mental capabilities has been conclusively discredited, Gall’s first two assertions have been supported. In support of Gall’s claims that the brain contained specialized functional areas came the research of Pierre Paul Broca of France and Karl Wernicke of Germany. These two men studied aphasias, which are disorders of language. Broca discovered that patients who displayed difficulty in generating speech, yet had no ailment of the mouth or vocal cords, often had a lesion (damage, such as that caused by stroke) in a very specific site in the left cerebral hemisphere. 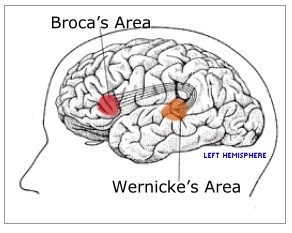 Wernicke’s patients, who could speak, but not understand language, also had lesions in another specific site of the left hemisphere. Wernicke thus came to the conclusion that the brain was a parallel distributed processor, meaning that complex functions, such as language, are the result of different brain regions working in both serial and parallel manners. In using using this model of cognitive function, Wernicke successfully predicted another aphasia called conduction aphasia in which these areas were intact, but the connections between them were compromised. Patients with this condition generate nonsensical speech, despite being able to form words and understand language.